Braising, simmering, roasting, grilling. Learn how four different heat sources and techniques turn the same ingredient into a variety of different dishes. Consider chicken. The same bird, depending on little more than the method in which it’s cooked, can make very different dishes: crispy roast chicken, char-grilled chicken, wine-braised chicken or a perhaps a long-simmered chicken soup. The flavors and textures resulting from each cooking technique vary—as do the wines that best pair with the final dish. A crisp steel-fermented Chardonnay, for example, is great with chicken soup, while grilled chicken might call for a savory Pinot Noir that has seen some oak to match the charred flavors. No cooking method is intrinsically “better,” and an understanding of cooking methods is a key to become a better cook and a more appreciative eater. To get you started, here are four popular techniques and how they affect your food. Get cooking. Braising involves cooking with a closed container and a little liquid, usually on the stovetop or in the oven. The idea is to cook at a lower temperature over a longer period of time (i.e., “low and slow”) with as little liquid as necessary, so the food keeps its shape, but stays moist. To stew is simply to braise with more liquid, so that the liquid becomes an integral part of the dish. However, stewed ingredients also break down more than those that are braised. In both braising and stewing, the food is often seared before the liquid is added, which deepens flavor and adds color to the food and cooking liquid. While boiled carrots can be watery and grilled carrots can burn before they’re cooked through, braised carrots develop a focused flavor and creamy texture. When braising, water can be used but other liquids can provide additional subtle flavor, as with this recipe for beer-braised chicken. Beer has complexity that infuses the slow-cooked meat, while its alcohol and bitter notes can cut through the richness of dark meat. Simmering is to cook in copious amounts of liquid, usually water. It often gets a bad rap when compared to more refined techniques, but it shouldn’t be overlooked. Examples include bouillabaisse (the classic French seafood stew), tafelspitz (an iconic Austrian beef dish), and the American clambake, which is a cross between a simmer and a steam. Boiling and poaching are essentially just simmering at higher and lower temperatures, respectively. Simmering can give a “clean” flavor that more flavor-intensive methods don’t. Boiled veggies may not sound appealing, but cauliflower that’s simmered in milk, strained and mashed with butter is a can’t-miss side dish that offers pure cauliflower flavor. Roasting is to cook using dry, indirect heat, generally in an oven. The food is usually left uncovered so that hot air directly comes in contact with the entire surface. Almost any vegetable will take well to roasting, but it’s wise to cook them separately, as each will have different cooking times. Your food can be lightly coated with oil to help keep it from drying out, but richer cuts like pork belly come with their own self-basting fat. When roasting, no additional flavor comes from the heat source itself, but the technique helps an ingredient’s natural taste evolve as it cooks. With meat, roasting usually creates pan juices as well, which intensify flavor when spooned over. 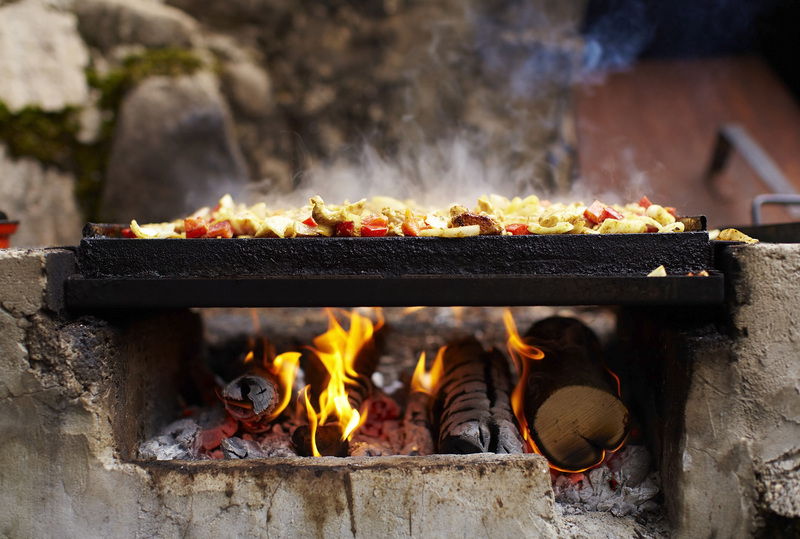 To grill is to cook over a direct heat source like fire or hot coals. However, it’s also a technique you likely already use indoors, including methods like stir-frying, pan grilling and broiling. Grilling is best for quick cooking at high heat. When grilling meat, tender cuts with little connective tissue work best, like filet mignon, porterhouse steak and pork chops. Meats sliced thin enough as to allow quick cooking also lend themselves well to this preparation style. For vegetables, choose those with high water content to avoid drying them out, like eggplant, peppers, zucchini, onions, celery and cabbage. Grill confidently and aggressively, as a bit of char adds flavor.